processing time up to 40%. 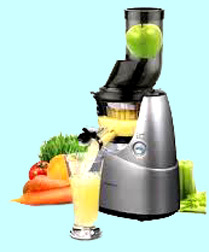 The Kuvings Whole Slow Juicer can produce a glass of fresh juice in seconds and eliminates the drawbacks of high-speed and slow juicers that harm and destroy important enzymes. The result is juice that's richer and more full-bodied, with a higher nutritional value and wonderful aroma. Extra-large 3 feeding tube for faster, easier juicing. The Kuvings Whole Slow Juicer's large feeding tube greatly reduces preparation and cleanup time; this provides the users with convenience and more time to enjoy their juice. 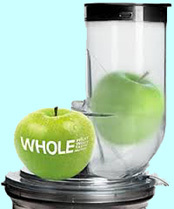 Close the Smart Cap while juicing to allow for mixing different fruits, vegetables, and liquids. Close the Smart Cap to help with cleaning . Just add water and close while running to aid in cleaning, and then open the cap to rinse. Close the Smart Cap after juicing to eliminate dripping. 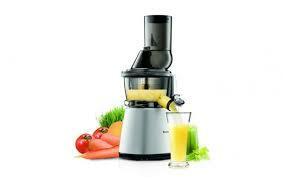 The BPA-free components help keep the juice free of unwanted chemicals with the Kuvings Whole Slow Juicer. Patented cleaning tools makes cleanup a breeze. Included: cleaning tool, brush, and cleaning wand. After Juicing the brush fits around the screen for easy cleaning. Versatility - Frozen Desserts! - A blank strainer is included to make various frozen desserts using frozen ingredients like bananas and strawberries. Compact Design - The Kuvings Whole Slow Juicer has a beautiful, compact design that complements your kitchen and fits under most kitchen cabinets. for Discount Savings in the shopping cart. also includes the Smoothie Strainer (large whole screen) for making smoothies.